So just got back from Disneyland, quick weekend trip for my birthday, the rain was crazy and If I’m honest loved it. 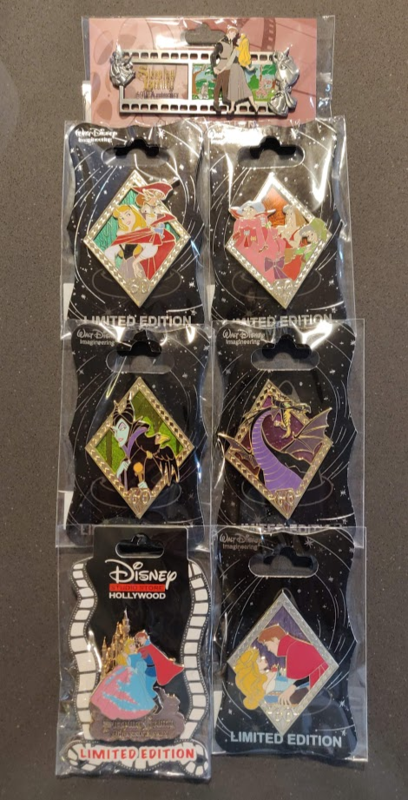 Was able to snag a few pins here’s what I got. 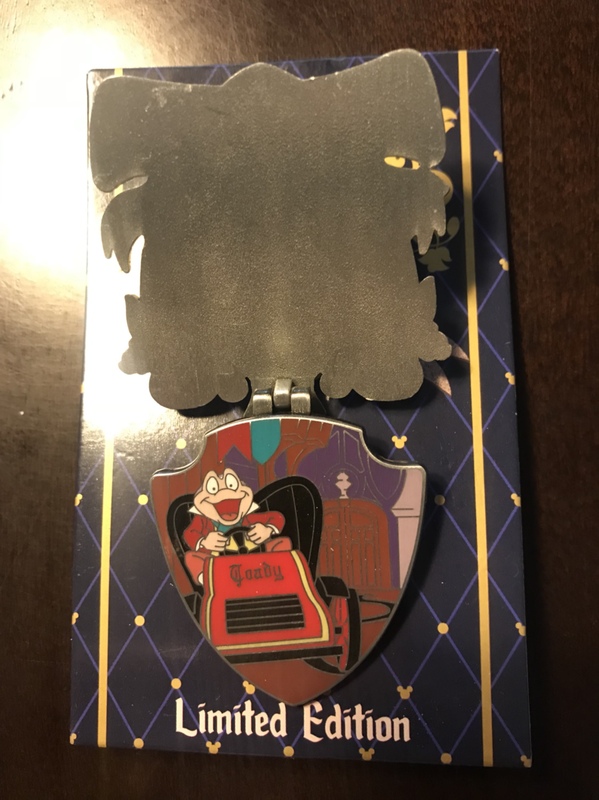 Originally wasn’t going to get the Mr. Toad pin but it was so nice in person I couldn’t pass it up. Now I think I’ll go for all of them. P.S. 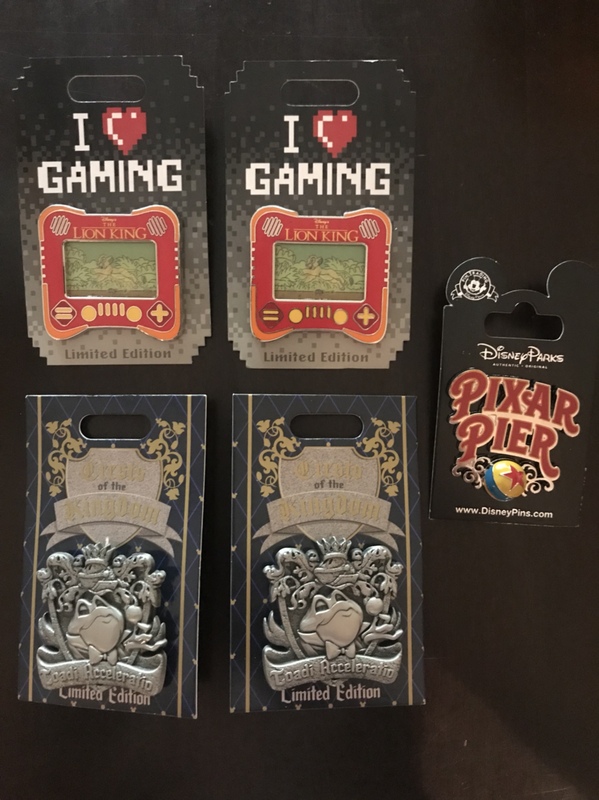 if anyone is interested in the I ️ Gaming series and is going to be in Disney World for the Aladdin release I’d love to trade. Great trip it looks like. I can help you with Aladdin. I need to find a trade for one of those Mr Toads also. I will send you a message. I've made several trades with the awesome members here. 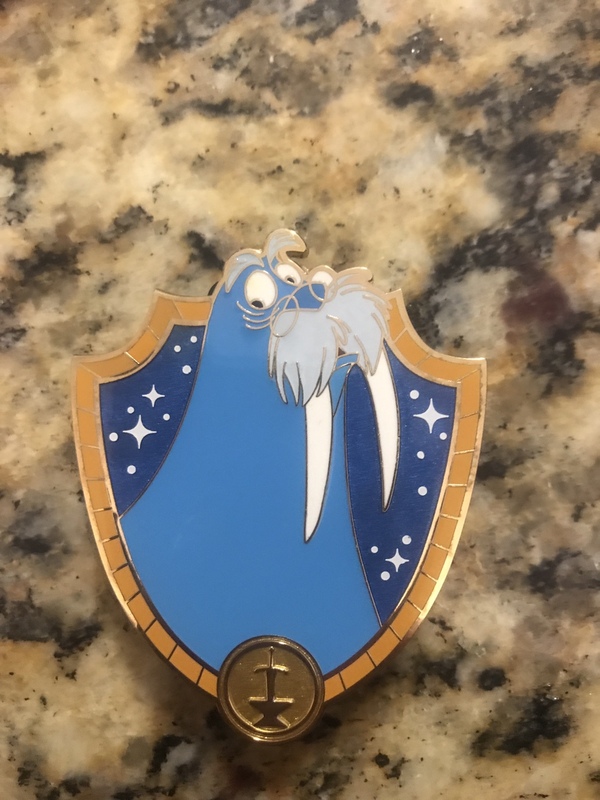 I traded @Blacksmoke for the WDI Wizard's Duel pin Walrus Merlin. I now have all the Merlins from this set. I traded with @DoReMarie for the Rapunzel for my sister. 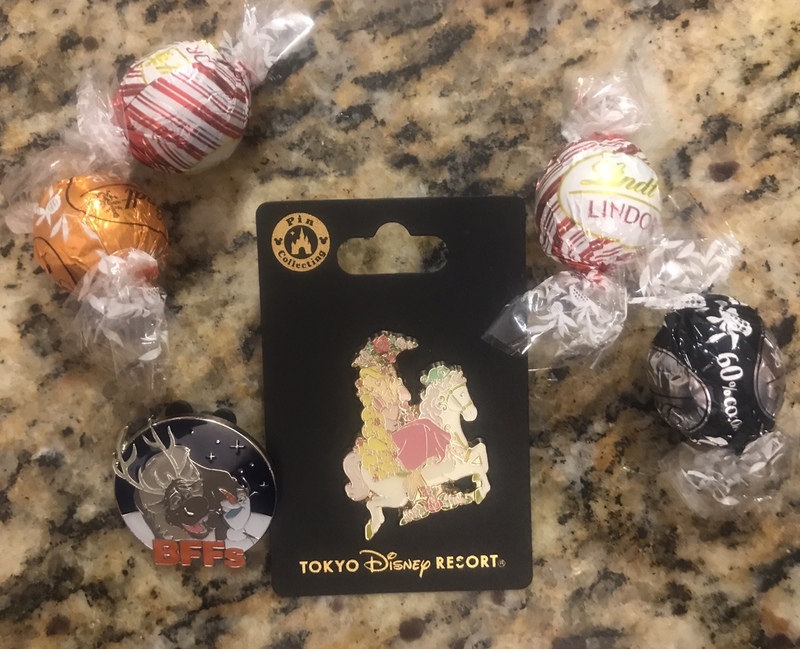 She was kind enough to include the cute BFF pin as a zap and the yummy chocolate. I traded with @summerskin. 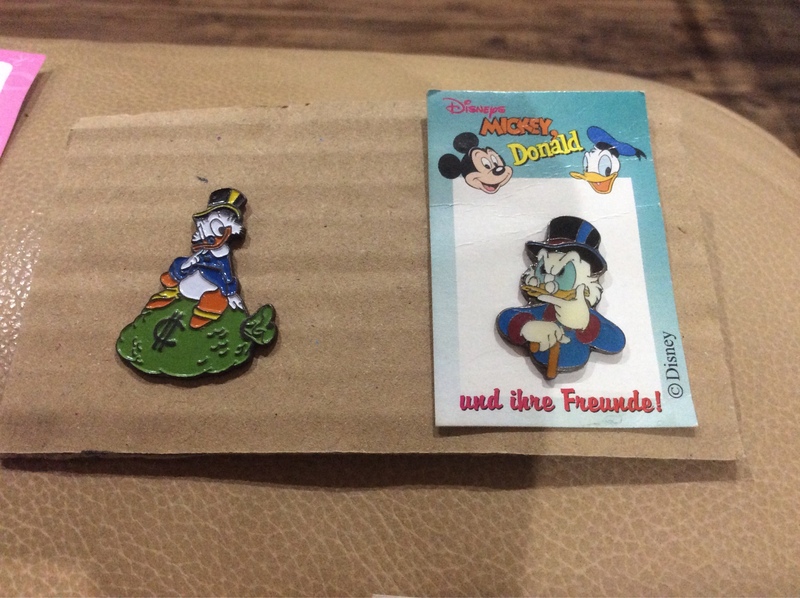 She added the great post cards, stickers, and candy when she sent her pins. I trade more here than anywhere else. I want to thank everyone for this "safe" and fun place to trade. Thank you for the great trade. Which pins are you still missing? I am missing Mim as Alligator. Ocean7, TheMickeyMouseRules, DisneyJ and 5 others like this. mickeymousje and Mike_Mouse like this. Ajk, mickeymousje, Haunted575 and 9 others like this. Woo-hoo! A big mail day today! 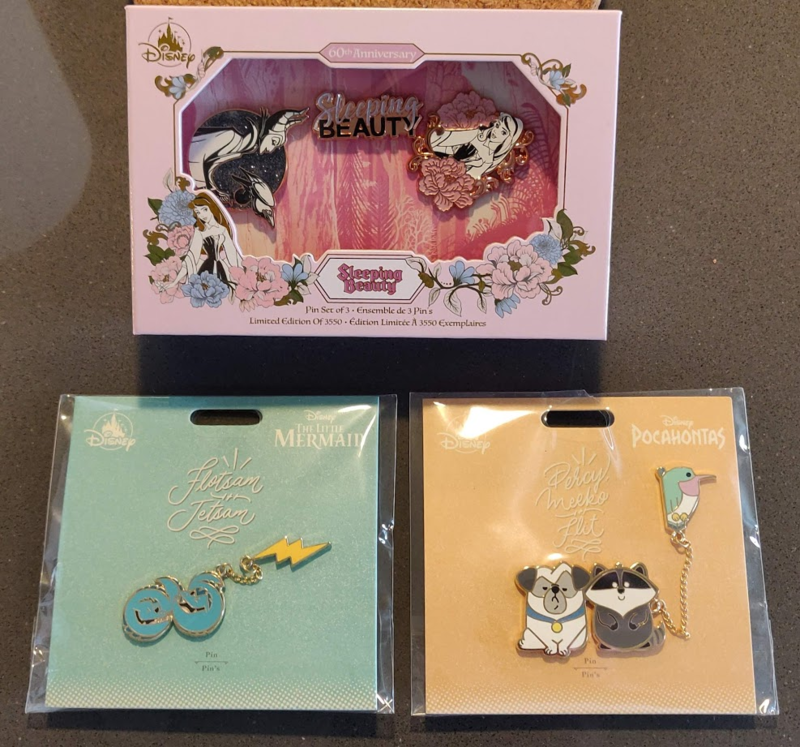 As predicted the Sleeping Beauty 60th has been pricey but since it's the wife's favorite classic Disney film I now have a few nice surprises for upcoming special occasions! I also like how these pins sort of cover the entire story of the film. I also didn't realize that the DSF pin was a raised pin on pin so it's more substantial than I thought it would be! 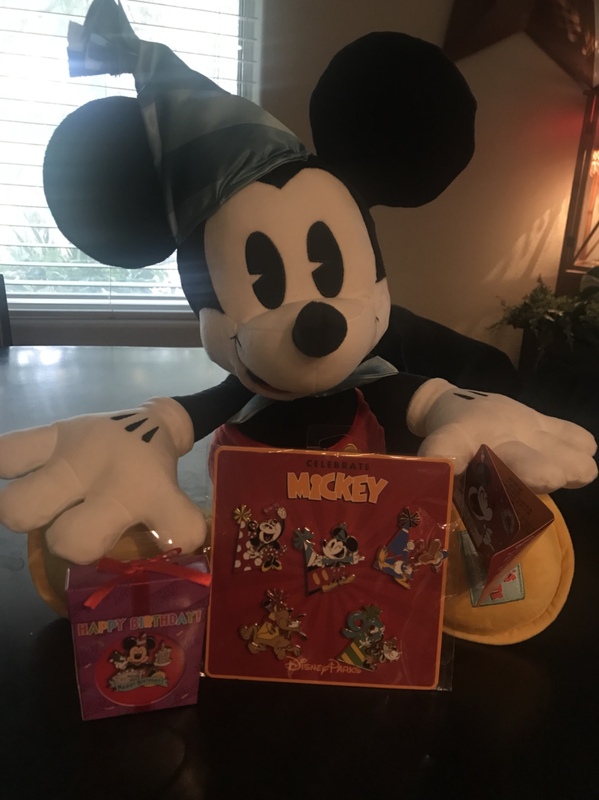 And finally a delivery from ShopDisney, I wanted to get the boxed set and I added on a couple of extra fun pins to get the free shipping. cyke23, Ajk, MommaIvy and 11 others like this. That little Olaf is so cute! cyke23, Ajk, TheMickeyMouseRules and 8 others like this. My Dad has real train cars, from when they bought them years ago at a CM pin party. I can take pictures when I am there (I leave on Tuesday). I think he even has those 2 specific ones to trade. 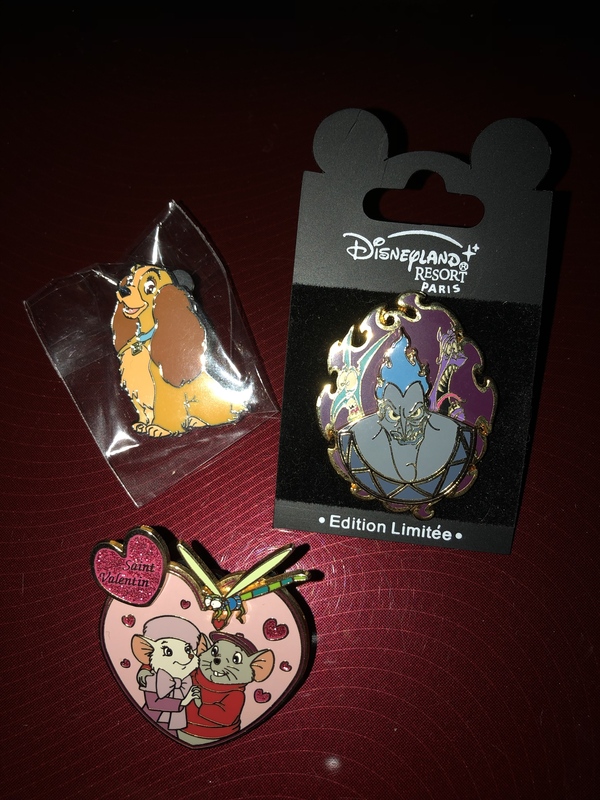 Made a trade for American Adventure pins with @krand1276. Not only did she wrap the pins so prettily, she sent along candy! Thank you so much. Two pins closer to completion! Ajk, TheMickeyMouseRules, CCofRR13 and 5 others like this. I am definitely a few mail days behind, lousy busy season, but here is one of my recent mail days! 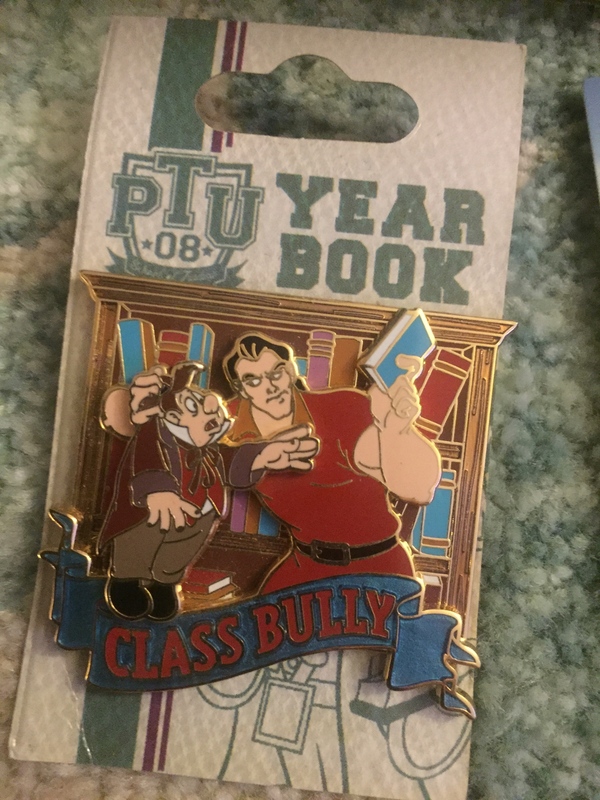 And it is a Herc/Gaston collector's dream! 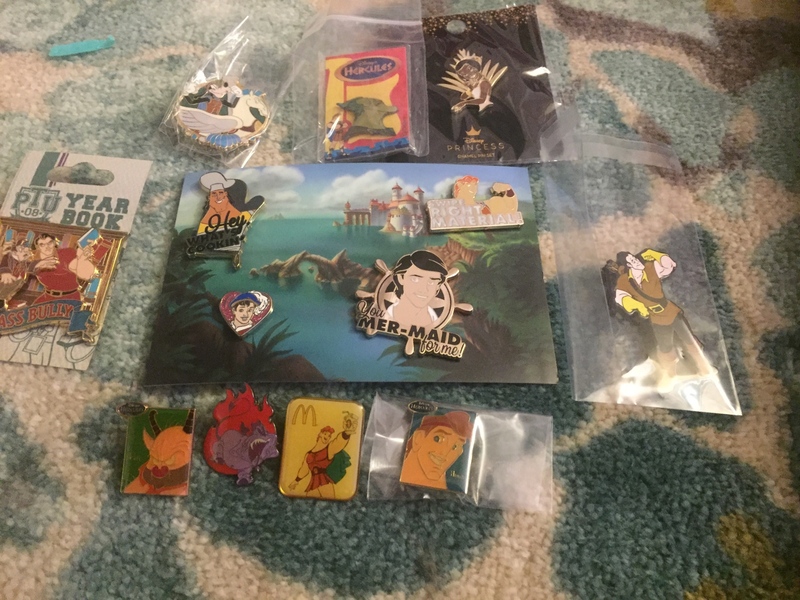 Add to that an amazing Tiana pin for my wife's non-collection PATF collection and an awesome Kronk pin and it was an amazing mail day. Thank you, again, @summerskin for letting me participate in your co-op and snagging me Herc, Kronk, and Eric! Oh and the Snow White's Prince (Prince Florian?) tag-along zap!! An absolute mini-grail if I ever saw one! 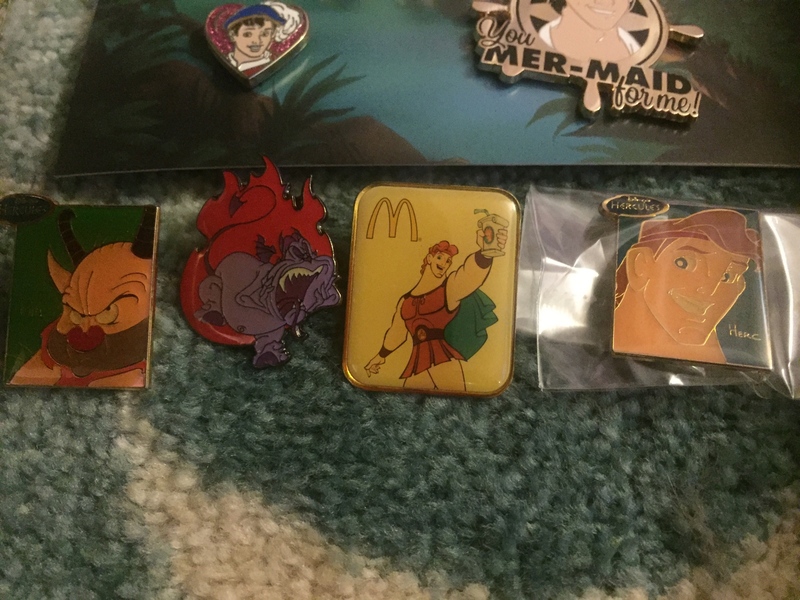 Only one Hercules ProPin left and I have completed that 9 pin set! 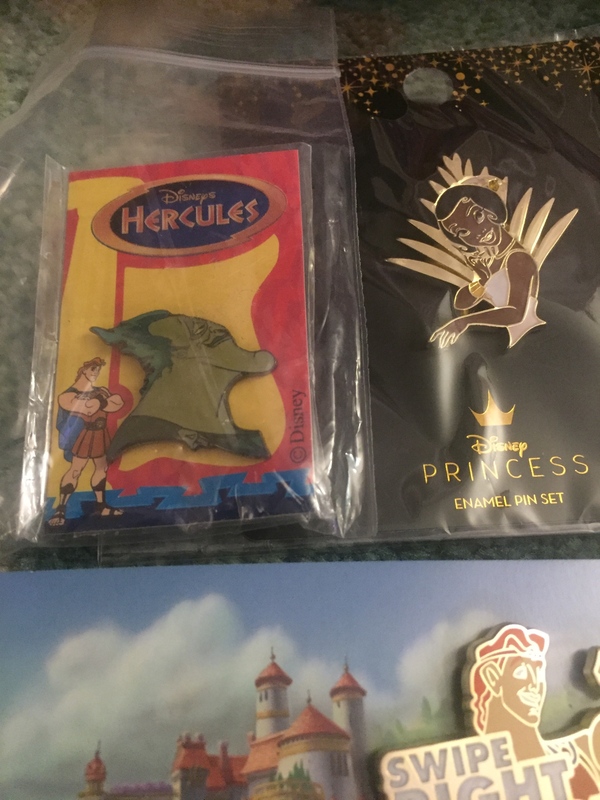 My 2nd McDonalds Hercules pin! There are still a couple I need to find. I still need to post about my Disney Auctions Yzma grail mail, but it's already on my board. I am only 4 ENG pins away from being a completist!! cyke23, Ajk, TheMickeyMouseRules and 6 others like this. Love the Chip and Dale! mickeymousje, Ajk, PixiePost and 4 others like this. My recent mail and a tale of drunken ebay purchases. I'm going to preface this next one with the story of how it happened. One night I was drinking with a friend and browsing on ebay. I made a bid on quite a few high end auctions; including a whole set of brand new hero profiles. I didn't expect to win any of them and had been outbid before I went to bed on all of them...or so I thought. I went to work the next day and around lunchtime got an email letting me know I had won an ebay auction. I was now to proud owner of a set of Hero profiles. I got them on a good price and managed to resell them. I met up with the buyer today and we took the pins out of the bubblewrap they were sent in. I hadn't opened them yet and low and behold we found our very own error Felix. The friend of my buyer who was going to take this one out of their coop passed. So now I have my very own Felix profile with him looking like he's trying to get a farmer's tan out here. So he is definitely up for trade if anyone doesn't mind the error. I wanted to give you the first right of refusal @timeerkat. Moral of my story: Don't drunk ebay and open your mail when you get it...not a week later when you're with your buyer. mickeymousje, cyke23, Ajk and 6 others like this. The porg pin is a new release at the Disney employee center. LE 250 I think... So cute. Might need to briefly expand my Star Wars collection to include that one. Okay, so I posted in another thread that we got a whopping 4 inches of snow here (I know that’s not much compared to some of you, but it’s a lot and very unusual for our area), and I haven’t checked the mail for a few days. 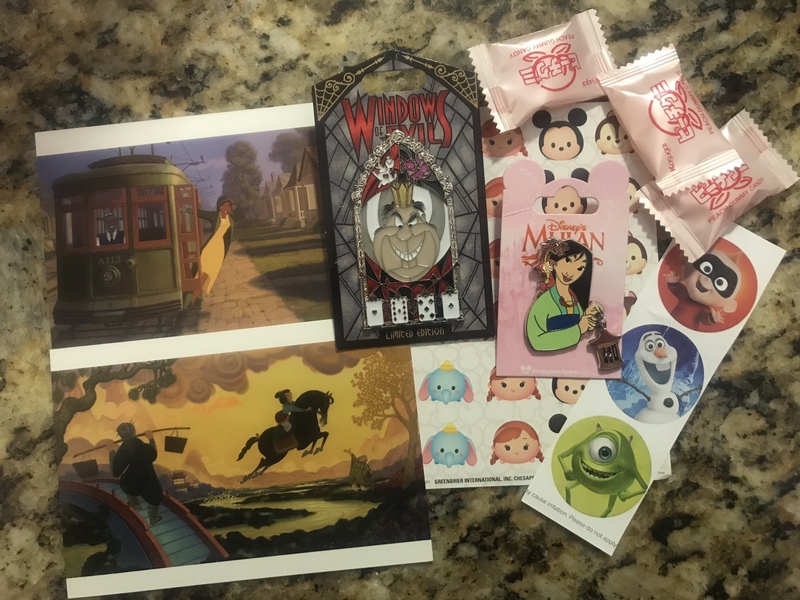 When my husband brought the mail in, I found a postcard from Omi and two pin packages. First was a package from @pins4twin. We traded 2 pins, but she sent a zap pin along with them! My husband and I are very excited about them. I also love the sticker from Hong Kong. Thank you so much! The other pin was from my trade with @Snoffsan. She traded two wonderful Scrooge pins! She also included a “small” zap that’s actually a HUGE zap for me! It’s a Nephews pin from Hong Kong! Thank you! I love it! You both were so generous. I appreciate it so much! mickeymousje, Ajk, CCofRR13 and 6 others like this. Oh no, why are they making all these cute low LE porg pins?! Going to need that one! Im so happy you liked the zap. I guessed that you collected the nephews from looking at your pinpics and even though that pin was not on youw wants list I hoped that you didnt have it already. 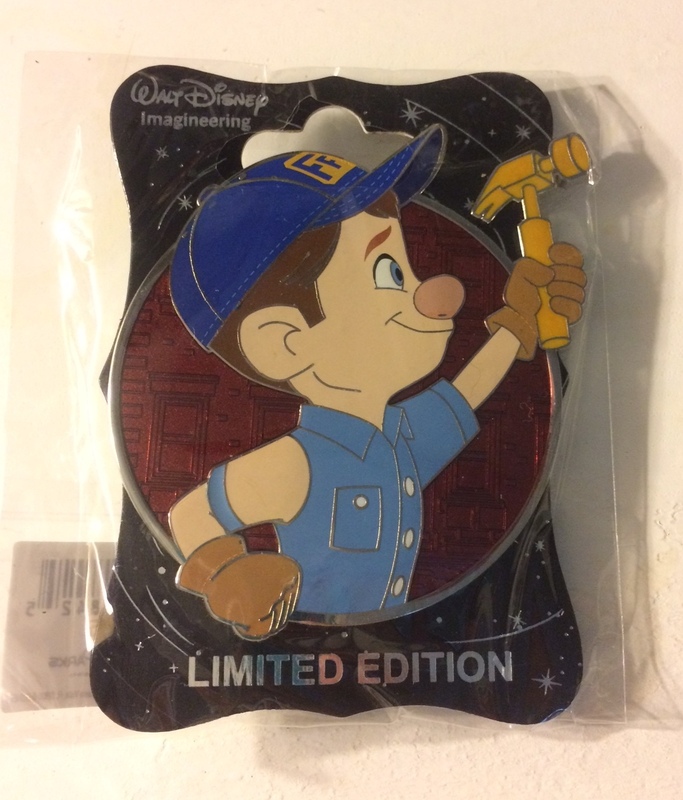 And thanks again for trading with me, helping me add pins to my birthday pin project! OMGosh!!!! 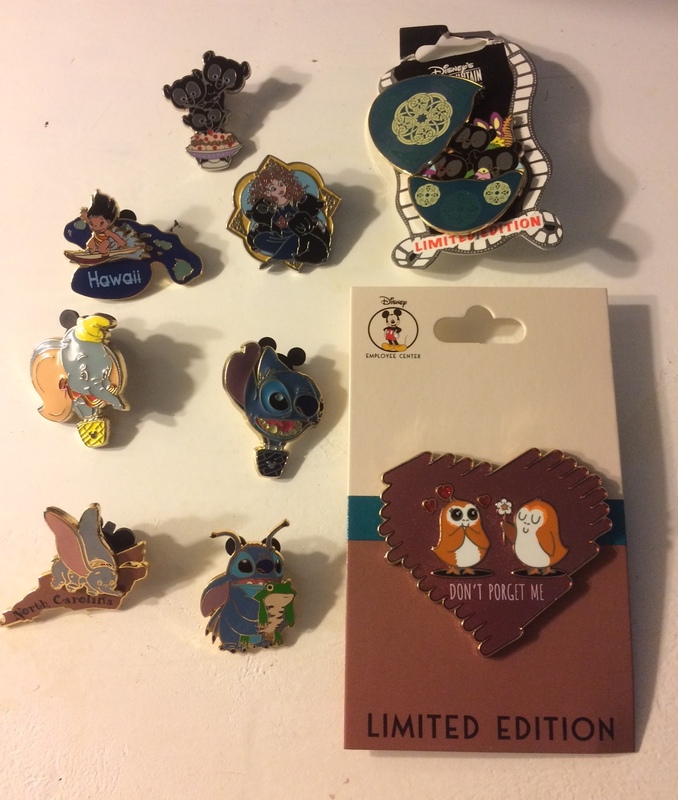 That Porg pin and Stitch with frog....beyond cute!!!! !